"This is an Instant Pot® recipe that even my picky 2 year old loves." Pour oil into the pot and add onion and garlic; turn to the "Saute" setting. Cook, stirring occasionally, until onion is tender, about 10 minutes. Mix carrots and spinach into onion mixture; stir well. 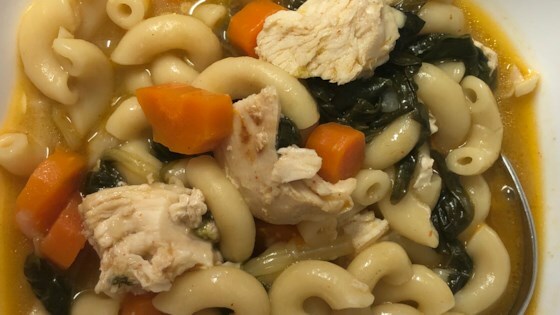 Lay chicken on top; add macaroni. Pour chicken stock and coconut cream over macaroni; add sriracha sauce, paprika, and salt. Close lid and cook using the "Manual" setting on high until chicken is no longer pink in the center, about 15 minutes. An instant-read thermometer inserted into the center should read at least 165 degrees F (74 degrees C). Release pressure through manual release. Delicious and easy. My entire family loves it so much that it has become a weekly dinner for us. I usually add an extra 1/2 chicken breast. The person who called it mushy. Cook your pasta separately and add it when you serve. Very tasty! I made it just as called for. I will make this again!